November is the month of gratitude and thankfulness in my classroom. We dive deep into what it means to have gratitude and why it’s important. When children are taught the importance of feeling thankful for what they have and are given, an attitude of gratitude is instilled in them. As teachers, it is important that we are fostering opportunities and guidance to do exactly that. This I Am Thankful Lapbook is a great way to implement these important life lessons. Students will work through the prewriting process as they complete each component of the lapbook. By the end of the project, students will have also completed an acrostic poem with the word THANKFUL. Families will love receiving these as keepsakes or even a Thanksgiving gift! It is important to note that this lapbook is going to take more than one class session to complete. For best results, break down the different components of this project and do a little bit each day. Read alouds are a great way to begin the lesson and open up class discussion. Complete the interactive components that are placed on the edges of the inside of the lapbook. The reason for this is because these interactive components serve as the students’ pre-writing. These activities are going to give them ideas for their acrostic poem. Students will use their interactive components to provide them with ideas for their acrostic poem. Before having the students write their poem, brainstorm a list of describing words that begin with the letters in the word THANKFUL. Write them on an anchor chart to save for the next day. Have the students help write an acrostic poem under your guidance as a whole class. Demonstrate to them how they can use the describing words from the anchor chart. Then release the students to work on their own acrostic poem and remind them to use the ideas they already wrote about in their interactive components that are already on the lapbook. Tip: When the students have finished the “sloppy copy” of the poem, have them write their name on a sign up sheet on the board. Call them over to the teacher table to edit their poem with you. While students are waiting for their name to be called, they can color their lapbook pieces. After they have met with you to edit their poem, they can cross their name off on the board. 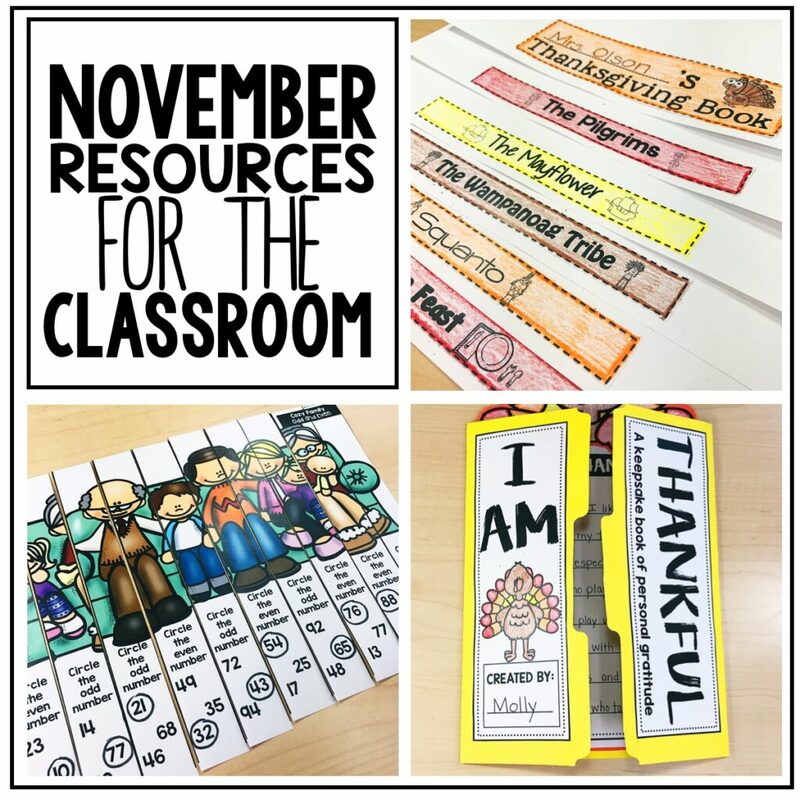 If you are looking for other Thanksgiving/November resources for your classroom, take a look at these. They can be found in my Teachers Pay Teachers store.